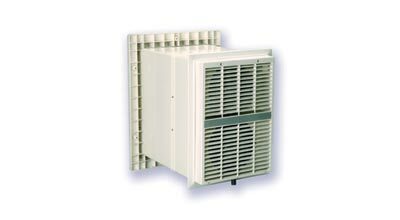 The HR300 provides ventilation with heat recovery. It is ideal for light commercial applications including function rooms, offices, classrooms etc. The HR300 unit comes complete with an integral shutter. The HR300 unit is designed for continuous operation providing up to 70% heat recovery. Effectively lowering internal relative humidity the HR300 unit controls condensation and eliminates mould. Fresh, pre-warmed air from the outside is continually supplied to the room with simultaneous extraction of stale moist air and smells. Heat is transferred via a unique plastic heat exchanger from outgoing air to the fresh air supply with no cross contamination, maintaining internal temperatures and providing a fresh indoor environment. The unit is fully controllable for speed using a small dedicated speed controller. Automatic ON/OFF control or switching to boost is easily achieved using sensors/timers e.g. humidistat. For summer operation the heat exchanger can be removed and replaced with a plastic divider board to provide positive cooling to rooms. The heat exchanger should be washed in warm soapy water every twelve months, or as conditions necessitate. Access to the filter and heat exchanger is via two screws on the internal grille. Filters should be cleaned by washing every six months or as conditions necessitate. Replacement filters can be purchased in packs of two. The HR300 unit requires a 380mm x 280mm hole. Units should be level and square in the wall.The unit should be fitted so that it overhangs by minimum of 50mm on the inside, and a minimum of 70mm on the outside. An extension sleeve is available for walls up to 650mm thick.